When you hear the word “chandelier”, it may conjure up mental images of old opera houses and murder mystery mansions. But did you know that these magnificent lighting fixtures are making a comeback? In fact, vintage lighting is currently trending in modern home decor. Keep reading to learn about chandelier placement and how to pick out the perfect one for your home. Let’s get started! Chandeliers come in many shapes, sizes, and styles. Check out these chandelier decorating ideas to see how they can work in every room in your home. Install a chandelier in your entryway to make a statement from the moment guests step into your home. 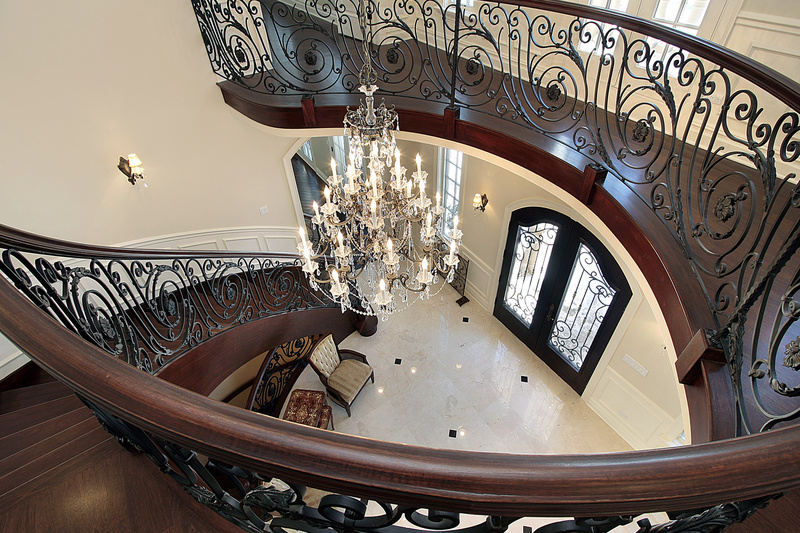 No matter how small or large your home is, an entryway chandelier is appropriate. It will either signal to visitors that a grand space is ahead, or make even a small apartment look luxurious. Whether you’re decorating your holiday home or your home base, the sleek, sharp lines of a kitchen lend themselves to a playfully styled chandelier. Lighten up this area of your home with a whimsical kitchen chandelier. Have fun with it! Nothing says master bedroom like an elegant lighting fixture. Try a bedroom chandelier to add a layer of charm to your sleeping chamber. If you have a high ceiling, opt for a layered, larger piece. For low ceilings, try something more understated. Install a chandelier in your living room to create the perfect mood for lounging. Look for moody, metal fixtures for a decadent touch. The dining room is the most classic place to find a chandelier. For this reason, it’s the best place to provide an unexpected style. Break the mold with a rectangular chandelier dining room fixture or a collection of glass bulbs. Eccentric designs like this will offset even the most traditional dining setting. So, how do you pick out the perfect chandelier for your home? Let’s find out. Don’t limit yourself. Check out your local lighting stores as well as the options online. Research chandelier decor styles beforehand to get an idea of what you might like. It’s easy to ignore size in favor of style when you’re shopping online. But, as we already know, not every size chandelier is appropriate for every room. Pay attention to each fixture’s dimensions to avoid any issues. As you can see, chandelier decor adds a layer of sophistication or whimsy to any room in a home. With these eye-catching fixtures, you’re sure to impress. Remember to shop both online and offline for chandeliers and do your research ahead of time. Opt for fixtures that both juxtapose and compliment the room they’re in. And don’t forget to pay close attention to the sizing dimensions! Want to read more? Check out our blog page for tons more awesome articles and information!